Among architects working in New York City in the modern era, John O’Malley (November 19, 1915-March 20, 1970) was one of the most prolific. Within the field of ecclesiastical architecture of the period he largely has no peer, in terms of both innovation as well as the sheer number of buildings he designed. This is all the more remarkable when one notes his sudden death at the age of 54. O’Malley started his career in 1935 in the office of Joseph Mathieu, a church architect primarily working in the 1930s through the 1950s. According to O’Malley’s family, he filled in for his sister as Mathieu’s secretary and although he was still in high school, this led to his interest in pursuing architecture . In addition to learning the trade from Mathieu, he studied architecture at Pratt Institute and engineering at Columbia University from 1939-41. He also assisted the prominent Brooklyn firms of Karl Blomberg and Slee & Bryson during his time with Mathieu . 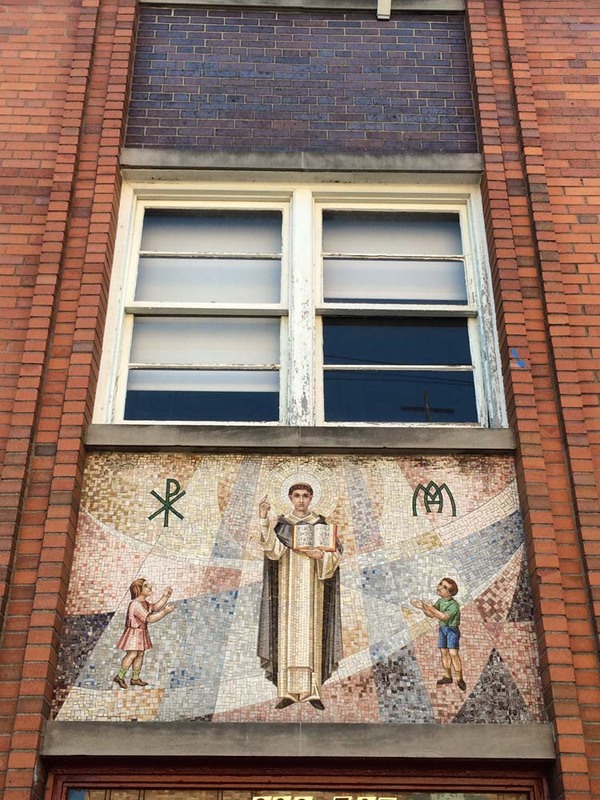 Mathieu’s later work is sometimes credited to O’Malley, with a notable example being St. Camillus Catholic School in Far Rockaway (1949), which features O’Malley’s name on the architectural rendering . 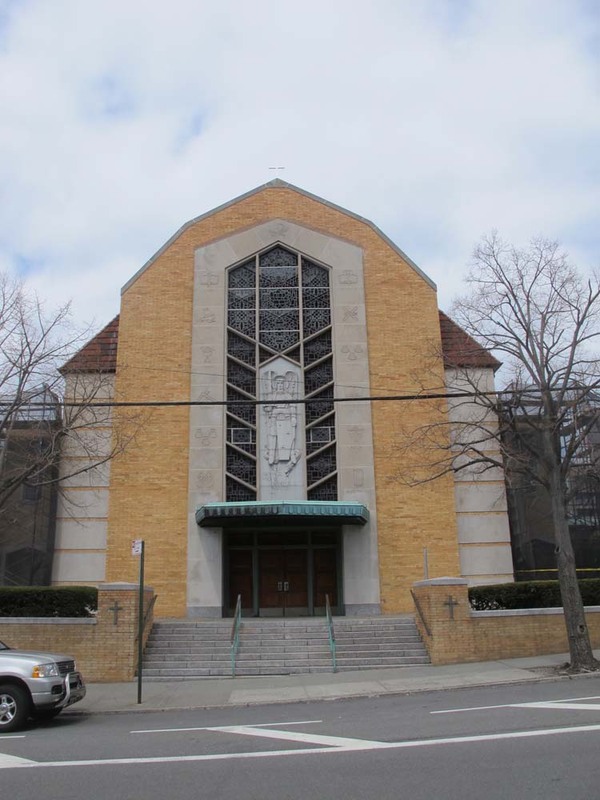 He possibly also had a hand in Mathieu’s two Queens Chamber of Commerce award-winning projects, St. John’s Cemetery Chapel in Middle Village (completed 1952) and Our Lady of Lourdes in Queens Village (completed 1956), although O’Malley had left to go out on his own in 1950. One of his first solo church commissions was a renovation project at St. Francis de Sales in Manhattan. There O’Malley constructed a new entrance staircase in an extremely constricted amount of space. However, according to existing records, this is the only project he ever did in the borough. He quickly turned his sights to Brooklyn, Queens, and Long Island, where the Dioceses of Brooklyn was rapidly expanding to keep pace with an influx of new residents and the need to replace aging and overcrowded parish buildings. The Diocese of Rockville Centre (Nassau and Suffolk Counties), became its own division in 1957. He became a member of the American Institute of Architects in 1955, with fellow ecclesiastical architects Henry V. Murphy and George Beatty supporting his application . Commissions increased in the late 1950s when he completed several new school buildings, primarily in Brooklyn. 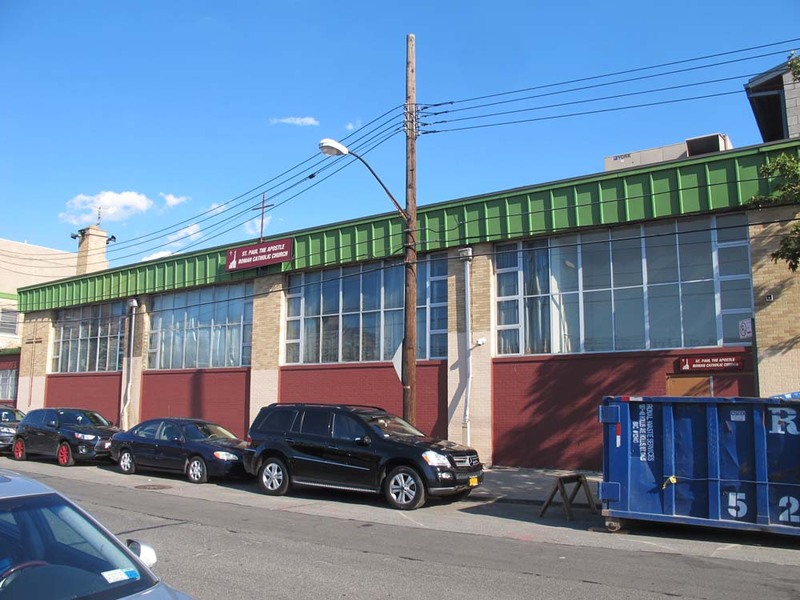 In 1962, the Queens Chamber of Commerce took note of his talent and commended three of his projects in their annual Chamber of Commerce Building Awards program. The most significant of these projects was St. Michael’s in Flushing, a large new church which replaced an older structure nearby. 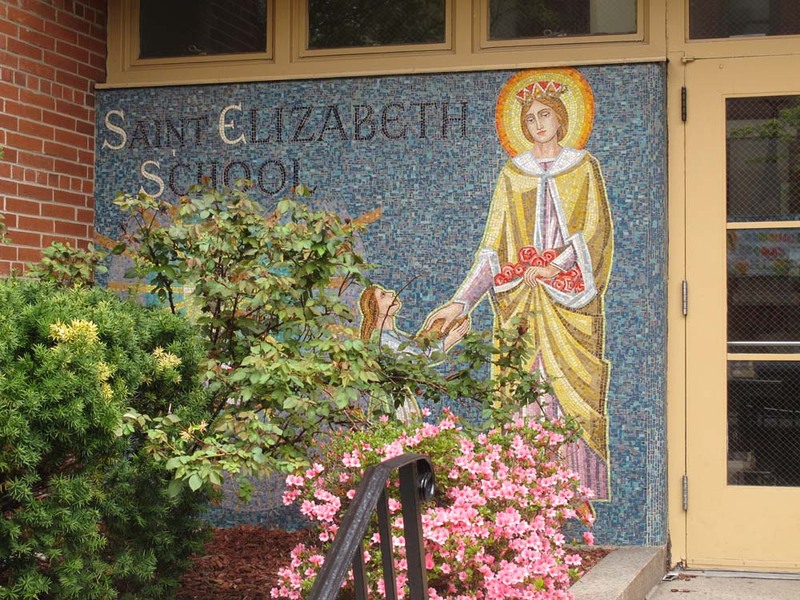 The others were a modest auditorium for St. Gertrude’s in the Rockaways and St. Elizabeth’s School, a relatively traditional design in Woodhaven with a striking entrance mural. O’Malley went on to receive a total of nine awards from the Chamber of Commerce over the next nine years for Catholic-affiliated architecture. O’Malley’s dedication to a project was absolute. He assisted a parish in all aspects of planning, from fundraising for the capital project to choosing the liturgical furnishings. His firm not only did major buildings but also did building assessments and minor renovations, and he became a favorite of the Dioceses, especially in Brooklyn and Queens. O’Malley helped guide many parishes through the whole process, including those with modest resources such as St. Leo’s in Corona and St. Margaret Mary in Long Island City. His family notes that he liked to meet with pastors and staff throughout and be in the field during construction, especially for churches . In a letter from the pastor of St. Michael’s to the Bishop of Brooklyn, he notes that in addition to designing the new church, O’Malley sketched plans for a new parish convent as a personal favor to the pastor and at no cost to the Diocese . By the mid-1960s, he was arguably the dominant church architect in Brooklyn, Queens, and Long Island. He had champions within the diocese such as Msgr. John J. Rudden, the director of the Diocesan Building Office, and consistently received referrals from previous clients for new parishes . He surpassed his older contemporaries like William Boegel and Beatty & Berlenbach who had deep relationships with the diocese earlier in the century. In the case of one church, American Martyrs, Beatty & Berlenbach were actually mentioned as architects for an earlier iteration of the project in 1954, which later when to O’Malley . He even designed the altar at Yankee Stadium for the visit of Pope Paul VI in 1965, although he did not attend the event . Unlike these more traditional firms, O’Malley’s designs evolved beyond the red brick and limestone that had long been favored. His designs are light, clean, and undeniably contemporary using brick in tans and oranges, striking stone and brick details on the exterior, and bright accessible interiors with colorful stained glass. His commissions contain original work by individual craftsmen like glass artist Albinus Elskus and mosaic artist Lumen Winter as well as established firms of the era such as Rambusch Decorating Company, Blenko Glass Company, and George Durhan & Son for stained glass . 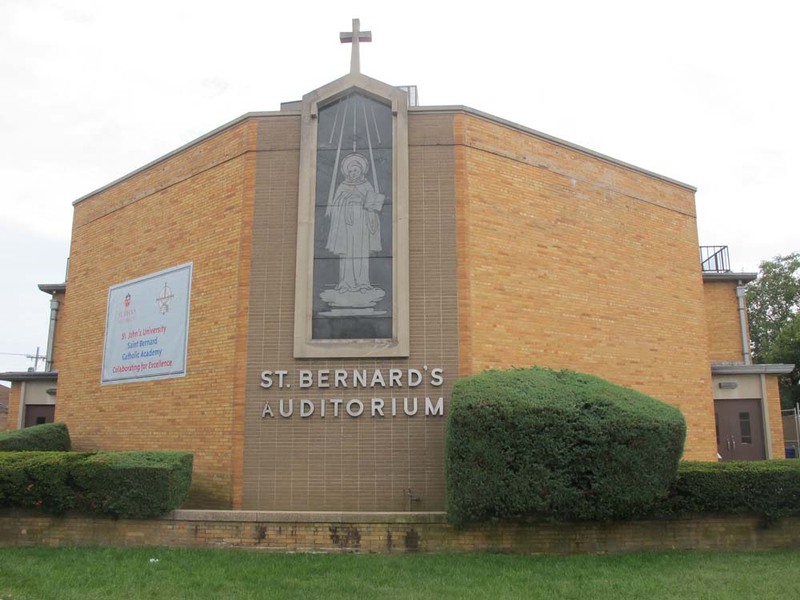 In the late 60s, he designed at least three round churches, Queens Chamber award winner, American Martyrs Church in Bayside and St. Mary Mother of Jesus in Brooklyn, a rarity for the time. This was just one example that demonstrates O’Malley’s interest in how the reforms of the Second Vatican Council were being interpreted in the construction of religious facilities. In these round structures the congregation sits in a semi-circle around the priest rather than the traditional layout with the priest at the head of the church. In addition, some of O’Malley’s churches lack communion railings, baldachins, and some of the other traditional elements that were slowly being abandoned. His most significant commission, won through a secret invited competition called B.C. 100, was Cathedral College of the Immaculate Conception, a completely new seminary for 400 students in Douglaston, Queens . The 27-acre campus, constructed from 1963-1967, included residences for students and faculty, a central round chapel, auditorium, and athletic facilities all fronted by a monumental entrance portico. The site is still extant today as a house of formation for college age seminarians, a retreat center and a retirement community. Some of the site has been sold off for further development. Although the late 1960s were arguably the height of O’Malley’s output, work for the Diocese started to dry up as 1970 approached. He branched out, serving on a mayoral committee for architecture and designing other buildings including his own family residence in Plandome on Long Island. He died suddenly in 1969 at the age of 54 and several of his projects were completed posthumously. Although he had staff, including a longtime associate, the firm closed within a few years. Therese O’Malley. Interview with author. 18 December 2017. Letter to Bishop of Brooklyn McEntegart from Pastor John P. Skelly. 29 January 1964. Roman Catholic Diocese of Brooklyn, Diocesan Archives. Letter to Rt. Rev. William Daly from Bishop of Brooklyn Molloy. 24 May 1954. Roman Catholic Diocese of Brooklyn, Diocesan Archives. Colm O’Malley and Therese O’Malley. Phone interview with author. 21 October 2014.